Precision & skill combined with humor, snappy music and classy costume makes this act appealing to the veteran audience member and to the kid in everyone. Carle was recognized for outstanding achievement at The World Circus Festival in St. Petersburg, Russia and received rave reviews as the pivotal Closing Act to the famous Circus Conelli in Zurich, Switzerland. 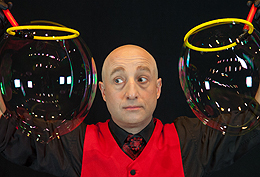 Mr. Carle has clearly found of brining fascinating soap bubble entertainment to circus and variety stages world-wide. Stage Show Bonus: Whenever possible Mr. Carle includes a "pre-show" to engage and focus your audience.